A wide range of claims may arise between contract parties in a construction project. In case of a construction claim, one or more parties seek entitlement to time extension or compensation for damages under the terms of a legally binding contract. Construction claims can be categorized in a variety of ways and based on different criteria. This article identifies the main construction claims and categorizes them in a tree-like structure that can be used as a basis for identification and review of such claims. As the above definitions suggest, a claim is made when one or more parties demand their contractual rights. These demands are materialized in the form of seeking entitlement to time extension or compensation for damages. Construction claims can be categorized in a variety of ways and based on different criteria. One may categorize construction claims based solely on responsibilities; whereas, another practitioner may prefer to categorize construction claims based primarily on their cause. 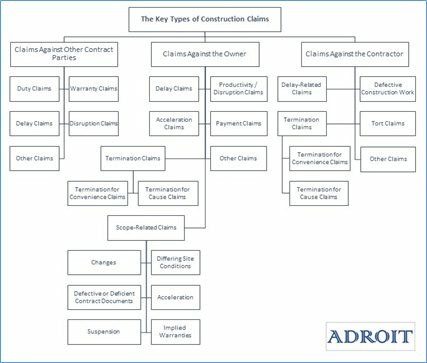 The following tree-like structure provides an example structure that can be used to categorize the key types of construction claims. As the above figure illustrates, construction claims can be categorized into the three main categories of claims against the contractor, claims against the owner, and claims against other contract parties. Claims against the contractor can further be broken down into delay-related claims, defective construction work, tort claims, termination claims, and other claims. These claims are typically made by owners and they primarily arise when an owner finds out that the contractor has not satisfied certain contract requirements in one way or another. Under such circumstances, the owner claim arises because the owner believes the contractor has failed to perform one or more obligations required under the construction contract. Claims against the owner are primarily made by contractors. These claims typically arise when contractors find some of the assumptions they made during the bidding phase to be invalid. These assumptions may have been made about project scope, project specification, site conditions, or about other project requirements such as expected delivery dates of owner-furnished equipment or material. These claims can generally be categorized into delay claims, productivity / disruption claims, acceleration claims, payment claims, scope related claims, termination claims, and other miscellaneous claims. Claims against other contract parties can be categorized into the main groups of duty claims, warranty claims, delay claims, disruption claims, and other claims. These claims can be against a design firm that prepares and governs the design process, construction management firm that manages the construction process, or any other major role player who is involved in contract disputes. Since the relationship between contract parties are governed by the terms of the construction contracts, these terms are the basis against which entitlements should be assessed and determined. In assessing construction contracts, not only contract forms and contract documents must be evaluated, contemporaneous evidence and records must also be assessed to ensure entitlements are assigned in a reasonable and equitable manner. A tree-like structure to categorize construction claims, such as the one provided above, is a good starting point to properly identify construction claims and differentiate between the types of construction claims that may arise in a construction project.
. Project Management Institute. (2017). A guide to the project management body of knowledge (PMBOK guide). Newtown Square, PA: Project Management Institute. You probably heard of a saying "Sticks and stones may break my bones, but words will never hurt me." It is easier said than done. Words do really hurt. As a Project Manager you have to have thick skin. Or, this job isn't right for you. You'll have competing priorities, urgent requests (some even absurd from your point of view), risks, issues, dependencies, and stakeholders from Hell. If you choose some of your words unwisely when your adrenaline is high you can cause others to be more confrontational, becoming enraged, or just act plain furious. Just remember, we are all human and everyone makes mistakes, or, can be misinterpreted. Rather than holding contempt for the other person be curious. Always give others the benefit of the doubt. How can a reasonable person act this way? What do I want from this interaction? What does the other person want from this interaction? What is best for the group in this interaction? For example: Say one of your stakeholders is starting to come late to the meetings, asking where we are in the agenda and for the recap. Rather than thinking how rude this person is - be curious. Ask the person why they are coming late to the meetings? Ask - if another time of day or another day would be better for them, provided it also works with the other stakeholders. Be proactive and ask what items on the agenda are important for that stakeholder and put those items towards the end of the meeting. Being curious, rather than holding contempt will serve you better in the long run. Both in your project's health and your own health. Do you have a common mistakes that a Project Managers Makes? If so, please contact Igor and it might appear in the next article. In episode 415 of this podcast, listeners can replay an interview by Cornelius Fichtner, of The Project Management Podcast™ of Kim Wasson, a self-described “professional project untangler” recorded at the uplifting Project Management Institute (PMI)® Global Conference 2017 in Chicago, Illinois. In this interview, Kim discusses the important role emotional intelligence plays in project management. Listen to learn more.